During the week I wake-up early enough to shower and get ready, make lunches and check work e-mail before the kids are awake. Then it is time for Juliana to get up, eat and get on her school bus. Then I get the boys ready and drive them to childcare. I return home to my desk to work. When the kids are home I stop working and spend the evening with them – dinner, playtime, baths, etc. 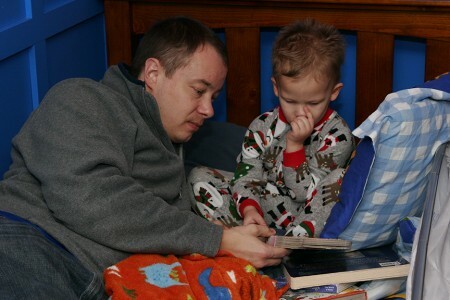 The boys should be ready for bed between 7:00 and 7:30 and Juliana goes to her room at 8:00 (she is allowed to read or watch one show on Netflix before going to sleep). 8:00 used to be the magic time, the start of my two hours between mommy time and sleep, but no more. We continue to have bedtime challenges since moving the boys to their beds. The boys seem to be convinced that their room is a party place and even if they are half asleep downstairs, as soon as we go to their room they turn wild. This short video is typical of how wound up they can be once they are in their room ready for bed. We had a lovely week earlier this month when we put the boys in bed each night and left and they stayed in bed and went to sleep. But that lasted a week and suddenly ended. For a while if someone stayed in the room with them, they would fall asleep eventually, but even that doesn’t seem to work any more. So each night we have quiet time reading and rocking and then they are tucked in and given the opportunity to go to sleep in their beds. Sometimes it is quiet for a half-hour and we think they are going to sleep. Then we hear yelling and return to their room and find blankets and pillows piled up and both boys together with no intention of sleep. So we resort to the only thing that is currently working, we remove Ruslan from their room and put him in our bed. 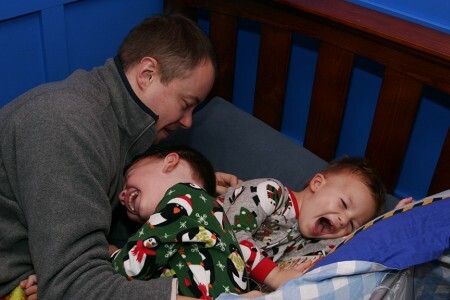 And both boys cry – Wyatt cries for Ruslan to come back and Ruslan cries to stay in his own bed…promising that he won’t get out of bed and will go right to sleep. The crying it goes one for….about 1 minute and then they both go right to sleep because they are tired. The wild, do anything but sleep behavior, isn’t because they aren’t tired; they would simply rather play together than sleep. Once Ruslan is sound asleep, I return him to his bed and all is well until morning. So while bedtime has been going long past 8:00, I no longer have that 2 hour break before bed. That is the time when I would download photos, blog, do laundry and other household tasks, get things ready for the next day, make lists, etc. Even when the boys are asleep by 9:00, I am so tired I don’t accomplish anything. In fact I am continually exhausted, I can fall asleep sitting up and I never feel rested. The boys are missing that sleep as well…so many unnecessary meltdowns. I have to believe that it is eventually going to get better; I need to have hope that I will get those 2 hours back some day. I am hesitating to put M in a crib for this reason, that he will not stay there! The girls already make me a little nuts with their night time antics. I fantasize about the day that they each have their own room. Good luck! Those two hours are necessary! There are side rail type things that my mother used for my brothers when they were little. They are for keeping them from rolling out of bed. They slide between the mattress and box spring and are totally removable. That might work as enough deterent to keep them in bed. It did my brothers. I know that you were probably not looking for advice but this post made me think of the ‘guard’ rails. They have side rails that keep them from falling out of bed once they are asleep. Unfortunately they do nothing to keep them from climbing out of their beds.